Comparative specifications of single plane cardiovascular imaging systems. Edition 2.0. Overcouch R/F systems comparative specifications. Edition 1.0. Undercouch R/F systems comparative specifications. Edition 1.0. Comparative specifications of single plane angiography systems. Comparative specifications of single plane cardiac systems. 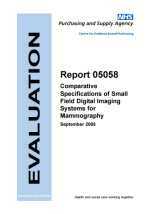 Comparative specifications of small field digital mammography systems. Comparative specifications of full field digital mammography systems. Guidance notes for NHS trusts on requirements for mobile trailers for breast screening. Guidance notes for film handling and processing equipment for breast screening.